Abstract - In this paper, an efficient scheduling technique for multiuser MIMO downlink with block diagonalization precoding in millimeter waves channel is presented. The scheduling technique is based on employing hybrid DE/EPSO optimization method to maximize the sum rate capacity for selected number of users for outdoor cellular systems. The proposed scheduling scheme achieves almost similar capacity performance to the optimum exhaustive search algorithm and compared with classical genetic algorithm technique. In this paper, block diagonalization beamforming performance is considered for different number of mobile users and different numbers of antennas at the receivers under correlated millimeter wave channel model. Abstract - The mobile telecommunication market in Ghana has grown significantly within the past few years, recording voice subscription base of 35 million and data subscription base of 18 million. The total number of base transceiver stations and Node Bs stand at 7502 and 4996 respectively. The rapid growth of mobile subscribers and number of base stations necessitate the need to study the relationship between traffic load and power consumption at a base station. There is energy crisis in Ghana currently and it is exigent to study the growing energy consumption in base stations. In this article, we investigate the effect of traffic variations on base station (BS) power consumption in Ghana. Continuous power and traffic load measurements were carried out at fully operated base stations in Ghana. Our measurement results show a linear relationship between cellular traffic load and BS power consumption. We then propose a real time traffic base station power consumption model for Ghana. Our study confirmed the claim that remote radio unit architecture is more energy efficient compared to ground mounted radio unit architecture. Remote radio unit technique increases base station energy efficiency by 32%. Abstract - Nowadays, mobile and video gaming has become more popular in younger generation. When an image gets displayed from one type of display unit to other, the down-sampling or Super-sampling is used. Down-sampling is used to display a high resolution image on the device supporting low resolution. During down sampling there are the chances of data loss which effectively blurs the image. So, to avoid this data loss we use the adaptive post filtering technique. This method is useful for low-cost mobile applications such as computer game consoles and palm computers, where the important design factors are low implementation cost and low power consumption. The main motive for this work is to allow human beings to obtain an image of high quality or the descriptive characteristics of the original image. There are different algorithms available for the same but it has some advantages as well as disadvantages. Here in this paper, the positive results of two different algorithms have been clubbed together to get better results and overcome with the drawbacks of both methods by getting improved results. 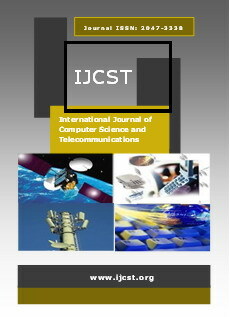 Abstract - The massive development and investment in the Ghanaian telecommunication sector and the act of deregulation in the industry has necessitated the deployment of Worldwide Inter-operability for Microwave Access (WiMAX) in the 2500-2690 MHz band to help serve the ever increasing needs of broadband internet subscribers in the country. In order to achieve the goal of providing comprehensive network coverage and high capacity WiMAX networks, a realistic physical layer performance evaluation of WiMAX has to be done to enable network operators understand WiMAX performance and provide a guide for future network deployment in Ghana. This paper undertakes a realistic performance evaluation of a pilot WiMAX network in the urban centers of Accra in Ghana. The physical layer performance of the deployed WiMAX systems is evaluated in terms of measured throughput and received power (RSS). This allows for a direct comparison with simulated results. Due to inherent system losses, it was realized that, not even a system with an optimum 2x2 adaptive MIMO antenna configuration was able to achieve the simulated throughput of 8.45Mbps. The results in the study show that, it is possible achieve a throughput of approximately 6.10Mbps downlink and 2.08Mbps uplink with the most robust modulation scheme, and a speed of 60mph in a densely populated urban environment making WiMAX a bright prospect for large-scale deployments in Ghana. Abstract - Activity Recognition based on the sensors available on a smartphone is becoming a widely researched area. Smartphones are capable of collecting vital data from the sensors. These sensors include acceleration sensors, position sensors, vision sensors, audio sensors, temperature sensors and direction sensors. In this paper we propose a filter based sensor fusion system that uses smartphones accelerometer and gyroscope data to identify activities performed. The data collected from the accelerometer and gyroscope is labeled according to the activity that is performed. Stastical features such as Mean, Standard Deviation and Skewness are extracted from the data. Accelerometer and gyroscope data are combined using Complementary Filter and Kalman Filter, and the stastical features are extracted. The classification and prediction is performed by Support Vector Machine (SVM). The experiment results show that the data fused using the Kalman Filter has higher accuracy than raw data and Complementary Filter. AKINOLA Solomon Olalekan and ABDULHAMEED Idris A.
Abstract - Road congestion is an optimization problem because of the difficulty it poses and its high unpredictable nature. Simulated Annealing (SA) and Genetic Algorithm (GA) have been applied to optimization problems; however, trade-offs exist as to which of the algorithms converges faster and the cost attached. Searching the optimal solution to the problem domain within a reasonable period is also a problem. This study is focused on performance evaluation of GA and SA as applicable to a crossroad and an adjoining T-junction Traffic congestion problem. The algorithms were simulated and implemented with MATLAB. The fitness values and traffic decongestion times for 10 cycles were measured. Statistical T-test was then used to compare their performances. The result showed that there was higher decongestion time in SA compared to GA with the peak values of 51 and 48 seconds respectively. The statistical test showed that, even though there were mean differences between the two techniques, there were no statistical significant differences between their performances.